Filtered for #lobstrosity. Back to unfiltered. #8 ultramarathoner. #12 runner. Extends streak to 4 days. #8 ultramarathoner. #12 runner. 2nd Longest personal run of this race this month. Grateful Dead 1967 - @TomZot Makes me want to hear that song. #8 ultramarathoner. #12 runner. 8th Longest personal run of this race this month. Group run around Ashley Reservoir and added three times up a big hill to McLane Reservoir. #1 ultramarathoner. #2 runner. 6th Longest personal run of this race this month. Extends streak to 6 days. @AOMM It was a nice surprise Street View! Beautiful morning on River Road in Rockledge, Fl. I haven’t been dedicating my long runs so I will gather them up and dedicate this to the big one..the Shining. Especially because we have a creepy old hotel/manor behind our house in Maine...it is so Stephen King! #24 ultramarathoner. #40 runner. 7th Longest personal streak grows to 6 days at 4.08 miles/day. I would like to again see the Shining. @FL2ME It is almost a 40-year-old movie, but still not for free on Amazon prime. #2 ultramarathoner. #2 runner. 3rd Longest personal run of this race this month. Extends streak to 5 days. @AOMM I wonder what happened to Ghost. I hope he didn’t get injured. Hope not either - @Ghost are you OK? #2 ultramarathoner. #2 runner. 2nd Longest personal run of this race this month. Extends streak to 4 days. Just bought Under the Dome at fundraiser for Millinocket Library! Have not started yet. #24 ultramarathoner. #40 runner. 9th Longest personal streak grows to 5 days at 5.06 miles/day. 3rd Longest personal run. More like #lobstrosity morning - great going! #24 ultramarathoner. #32 runner. 4th Longest personal run of this race. Extends streak to 4 days. #44 runner. 5th Longest personal run. Finished in 44th place. Great to meet you today @BigRed68 Congrats! Congrats @BigRed68! It was great meeting you today. So glad to have been able to present you with your virtual race medal at the library mini-golf fundraiser @BigRed68 ! Looks like your running partner is short a medal compared with you. Am going to see if can extend this virtual race to incorporate Crow Athletics' Streak-100, so anyone who wants to start the new year off right, can aim for the 2019 version of the virtual race medal, to be unveiled soon. Will be announcing results of gift giveaway drawing soon too, once I get everyone's 2018 virtual race medals off in the mail. It's a cottage industry, managing a virtual race. #8 ultramarathoner. #12 runner. 8th Longest personal run of this race. Great finish and super to meet you after you ran 2:01:36 and placed No. 6 in your age group! It’s got to be tough to run in that kind of cold. Great finish; sad I missed it! Congratulations! If you do Millinocket @FL2ME you'll have a blast! Great to meet you at last, @TomZot, at the Sawmill. And what great stories you have to tell. #23 ultramarathoner. #32 runner. 2nd Longest personal run. 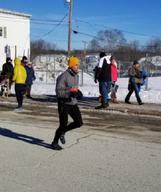 Just barely 10, but I was determined to get them in while my fellow virtual runners were freezing in Millinocket! Congratulations, everyone! #25 ultramarathoner. #40 runner. Longest personal run of this race this month. 2nd Longest personal streak grows to 19 days at 4.13 miles/day. Thank you for being there with us in spirit! And congratulations on your #lobstrosity miles! Keep logging those miles until at least Dec. 31. And do you have an SK dedication? #19 ultramarathoner. #29 runner. 5th Longest personal run. Congratulations and yay for supporting an inaugural race! Some nice team #lobster apparel modeled by a woman at our local running store - the Boston 2017 editions of Brooks Launch. #18 ultramarathoner. #27 runner. Longest personal streak grows to 130 days at 3.00 miles/day. 6th Longest personal run. The two-fer makes this a #lobstrosity day! #14 ultramarathoner. #20 runner. Longest personal streak grows to 439 days at 3.43 miles/day. 6th Longest personal run. 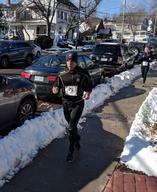 Millinocket Half Marathon training unofficial 10k: 53:23!!! #16 ultramarathoner. #22 runner. 10th Longest personal run of this race. 5th Longest personal streak grows to 6 days at 4.64 miles/day. Sounds like you might PR in Millinocket! #lobstrosity! @AOMM that would be AMAZING!!! About half solo on trails and half with a friend on roads. I dedicate this run to The Shining. I may have already done this book but it is one of my favorites and this morning was so cold I felt like a frozen Jack Nicholas at the start. #2 ultramarathoner. #2 runner. 5th Longest personal run of this race. Longest run in race this week. Extends streak to 6 days. It IS cold earlier than sort of normal, right? #25 ultramarathoner. #29 runner. 8th Longest personal run of this race this month. 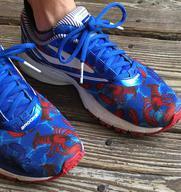 As you are #lobster and #lobstrosity member, it's fitting to run on water! Happy Thanksgiving! Including these miles in today's updated spreadsheet. #18 ultramarathoner. #27 runner. Longest personal streak grows to 125 days at 3.00 miles/day. 10th Longest personal run. Anything special for Thanksgiving dinner when in FL? Must be regional specialties. Used to live in Plymouth, MA, and the Plimoth Plantation sold a cookbook featuring traditional New England Thanksgiving recipes, like creamed onions and mashed turnip. Used to make them, just to be traditional. But not so tradition-bound anymore. If I figured things right, the end should be in sight. Literally. Still need to double back through Millinocket before the last stretch, but should be able to see the mountain in the distance on the street view. #44 runner. 5th Longest personal run of this race this month. Passed 1 runner. You know the virtual map like the back of your hand! Saw your Facebook question about whether anything special needed to happen to get optional team medal, as an add-on to the official Acadia to Katahdin Finisher's Medallion. All you need to do is tag me, either here or on Facebook, and let me know which version of the team medal. For example, as you qualify for both #lobstrosity and #MonsterMoose, you can custom order one with 2 lobsters and 2 moose. I can then e-mail you invoice - same price, $18 for all versions of optional team medals, and @AOMM and @4000footer can do the honors of presenting the medals to you in Millinocket. @AOMM I guess I'll stick with the original medal. The way I display my medals you can't see the ribbons, so the extras would just end up being covered up anyway. And that gives me #lobstrosity to go with my earlier monster moose. And if it's a lobstrocity, it has to be dedicated to King's Drawing of the Three. #44 runner. Passed 5 runners. And that puts me onto the course for the Millinocket Half. On the Golden Road. @BigRed68 - good going on making both elite clubs! So what do I need to do to get the special bling for that? Hi @BigRed68 - sorry I didn't see this post until just now, but did answer above - all you have to do is tag me that that is what you would like to get, special bling for making both elite clubs, and I'll e-mail you invoice. Looking forward to presenting the medals to you in Millinocket! Am thinking we'll be at the Sawmill from 6 to 8 p.m. on Saturday, for those who can make it then. And will also try to let folks know where else we'll be over the weekend, in case the Sawmill doesn't work for everyone at that time. #18 ultramarathoner. #27 runner. Longest personal streak grows to 123 days at 2.99 miles/day. #19 ultramarathoner. #27 runner. Longest personal streak grows to 122 days at 2.98 miles/day. #lobstrosity achieved, thanks to a long half marathon in St Pete this morning. @AOMM Thank you for hosting this great event! #29 runner. 4th Longest personal streak grows to 11 days at 4.48 miles/day. 4th Longest personal run. Finished in 29th place. These miles are dedicated to the newest SK release, Elevation, because there is a chapter that describes the runners of a Thanksgiving road race that had me laughing out loud. Congratulations on the real-life and virtual summit of Katahdin, and the #lobstrosity miles - knew you could do it! Medals on the way to you. Elevation sounds like the perfect addition to the virtual race book club, both because it includes a Thanksgiving road race, and because Katahdin has elevation! You can keep logging miles until Dec. 8, and can earn extra entries in the gift giveaway, drawing in time for the holidays, by landing on some more of the special spots embedded in the virtual race map. #8 ultramarathoner. #12 runner. 4th Longest personal run of this race this month. #19 ultramarathoner. #27 runner. 6th Longest personal run of this race this month. Longest personal streak grows to 121 days at 2.99 miles/day. #8 ultramarathoner. #12 runner. 3rd Longest personal run of this race this month. Wow! I admire that consistency. #2 ultramarathoner. #2 runner. 4th Longest personal run of this race this month. Extends streak to 4 days. #56 runner. 2nd Longest personal run of this race. Back after 6 days. Passed 2 runners. #lobstrosity miles! And on one of the "Calendar Islands," no less. See the smokestack during the race? #19 ultramarathoner. #27 runner. 4th Longest personal run of this race this month. Longest personal streak grows to 120 days at 2.99 miles/day. #lobster legs back in action! #27 runner. Longest personal streak grows to 116 days at 3.00 miles/day. Longest personal run. Finished in 27th place. 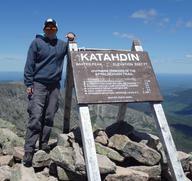 #lobstrosity to the top of Katahdin - congratulations!! #29 runner. Longest personal streak grows to 115 days at 2.94 miles/day. #7 ultramarathoner. #12 runner. 2nd Longest personal run of this race this month. #lobstrosity! So, should I extend Round #2 as it technically ended yesterday? Or start Round #3 today so that there is no gap for members of either team? About to unveil optional team gear too. Decided to start Round #3 today, so these #lobster miles will count. Nov. 11-Nov. 24 constitutes Round 3, while Nov. 25-Dec. 8 will be Round 4. Thanks for being part of the virtual race! #28 runner. 3rd Longest personal run of this race this month. Longest personal streak grows to 114 days at 2.96 miles/day. Passed 1 runner. Getting ready for Millinocket...although couldn't go the #lobstrosity distance - that'll have to be during Round #3. #35 runner. 4th Longest personal run of this race this month. Longest personal streak grows to 9 days at 3.61 miles/day. #2 ultramarathoner. #2 runner. Longest run in race this week. Extends streak to 4 days. 8th Longest personal run. Wow, you are singlehandedly keeping #lobster in the running! Double #lobstrosity! @4000footer @AOMM I forgot to dedicate this run to a Stephen King book. I think I’m go with The Langoliers. Another SK book for the reading list. @4000footer just took out A Bazaar of Bad Dreams from the Osceola Library, and I just ordered The Skeleton Crew from Amazon. #28 runner. Longest personal streak grows to 113 days at 2.95 miles/day. #lobster calisthenics, as one needs to stretch before aiming for #lobstrosity miles sometime between now and midnight Nov. 10. #36 runner. Longest personal streak grows to 8 days at 3.11 miles/day. #27 runner. Longest personal streak grows to 110 days at 2.99 miles/day. Passed 1 runner. #27 runner. Longest personal streak grows to 109 days at 3.00 miles/day. Passed 1 runner. A long run through NYC with 52,000 friends. #41 runner. 5th Longest personal run. Passed 6 runners. Wow, you did NYC - congratulations! @LibertyPenguin and @Keefa also were among the 52,000 friends. And because you did 10 or more miles in one day, you make the elite clubs of #lobstrosity and #MonsterMoose! #27 runner. Longest personal run. Passed 1 runner. You make the elite #lobstrosity club with this entry! You qualify for the elite club of #lobstrosity with 10 or more miles in one day - congratulations! I was thinking 2:15 must have felt like a walk in the park for you! With 10 miles or more in one day, you make the elite #lobstrosity team, in honor of Halloween and Stephen King. Congratulations - go team #lobster! Had hoped to avoid racers in the 10-mile trail run this morning, but misread the map and saw them all as they ran up and down Snows Mountain. Fortunately plenty of room, and not too many runners. To meet @Ghost's challenge: Dedicating the long run to SK's The Dark Tower II: The Drawing of the Three - haven't read it yet, or seen the series, but it's on my list because of #lobstrosity. Read about this monster lobster in a book entitled I, Lobster, about the history of the crustacean in art, literature, music, movies, history, science and cuisine. And taking a page from @LibertyPenguin, am splitting these miles to give more to Team #lobster, as it needs to catch up with #moose: 8 miles to Lobster, 3.62 to Moose. #36 runner. 6th Longest personal run. Passed 5 runners. @FL2ME - hope you're not in Michael's path.... Stay safe everyone in this virtual race who's in FL. #36 runner. Extends streak to 5 days. Ah - a member of team #lobster in FL! Adding all your miles to the team roster, dating back to Oct. 1. I believe there are FL lobsters - are they anywhere close to the size of a #lobstrosity ?